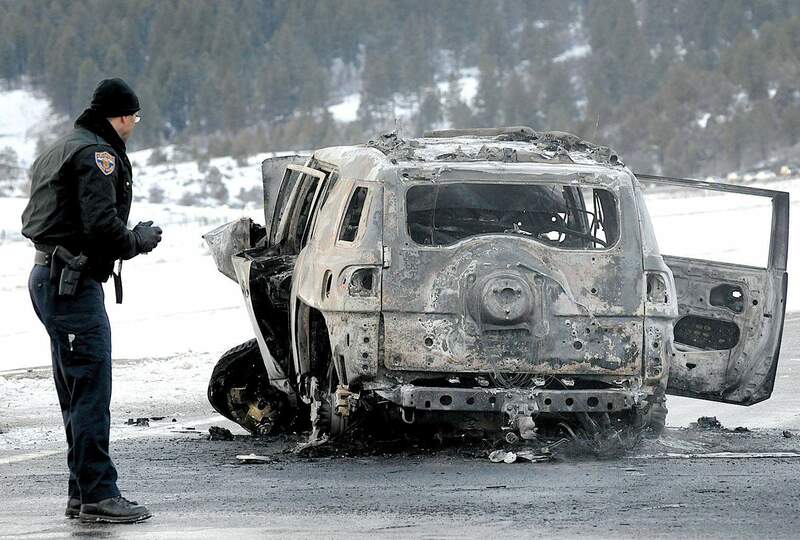 Two people – Robert McDonald and his son Jaden, 10 – died when this vehicle, an eastbound Toyota FJ Cruiser, was hit head-on and burst into flames on U.S. Highway 160 about three miles west of Hesperus on March 22, 2011. The surviving McDonalds are suing Toyota for not providing a proper impact-management system. A family involved in a triple fatal crash two years ago west of Durango is suing Toyota, saying the carmaker’s FJ Cruiser lacked a proper impact-management system, which caused it to burst into flames. The head-on crash occurred March 22, 2011, about three miles west of Hesperus on U.S. Highway 160. Leslie McDonald and her son Kellen McDonald, then 12, suffered burns over 60 and 70 percent of their bodies, respectively. Leslie’s husband, Robert “Bobby” McDonald, and their other son Jaden, 10, were killed in the fiery crash. Retired Farmington Police Department officer David James Hooper, 51, also died in the crash. Hooper, who was under the influence of painkillers at the time of the accident, drifted over the double-yellow line and collided head-on with the 2008 Toyota FJ Cruiser. Both vehicles caught fire. A 20-page complaint filed in federal court says a design flaw caused a “catastrophic failure” of the vehicle’s fuel-storage management and delivery systems. More specifically, the 2008 FJ Cruiser’s impact-absorbing body structure and frame crumple zones did not operate properly and failed to provide the McDonald family with a reasonable degree of protection, the lawsuit says. As a result of the head-on crash, the vehicle’s drive shaft penetrated the fuel system, causing vapor and liquid gasoline to come into contact with a number of ignition sources and catch fire, the lawsuit says. Toyota had knowledge of the risk or should have had knowledge of the risk, the lawsuit says. The lawsuit seeks damages for the surviving family members, who have undergone great mental, physical and emotional suffering. They also have suffered permanent disability, have incurred extensive medical expenses, will continue to have expenses into the future and have experienced lost earnings, the lawsuit says. Denver lawyer Richard Hood, who filed the lawsuit, did not respond to an email seeking comment, including how much money the McDonalds are seeking. John R. Trigg, a Denver lawyer representing Toyota, also declined to comment, other than to say he filed a motion to have the trial held in Durango. No date has been set, and it is possible the case will be settled out of court. “We expect it to be proven that Toyota did not cause this accident,” Trigg said. In a legal response to the complaint, Toyota denied any wrongdoing. “The vehicle in question met or exceeded all existing industry standards,” the response says. The response says Hooper had been stopped or arrested multiple times for driving under the influence or for careless driving, and he is the sole cause of the crash. Hooper was traveling westbound in a 2011 Chevy pickup when it crossed the center line and entered the eastbound lane. Both cars were traveling about 65 mph, the posted speed limit, and collided almost directly head-on. Both vehicles caught fire and burned to their shells in the middle of the highway. Leslie McDonald and Kellen were able to exit the vehicle. The mother was on fire, and passers-by helped stabilize her and her son, according to law enforcement.